"The sounds and playing quality are top notch, (…) the material is generally very tasty and rarely bland." 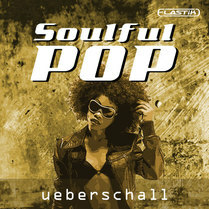 I wasn’t quite sure what to expect from a sample library entitled Soulful Pop as, while it is a musical genre that can include the most classy and tender of musical emotion, in the wrong hands it can easily cross the line into the most sickly and (hopefully!) forgettable of ballads. Thankfully, Ueberschall seem to have managed to stay on the tasteful side of this divide with their latest Elastik based library. And with nearly 4GB of sample data divided into 18 construction kits, there is plenty of mellow, down tempo material to help you create either loved up, warm and fuzzy or sad and reflective atmospheres. The sounds and playing quality are top notch and, while I found some of the construction kits more engaging than others, the material is generally very tasty and rarely bland. In particular, the guitar work is excellent. The rhythm playing is relaxed, with some really nice use of wah wah (or some other filtering effect) to add additional rhythmic elements to the playing. While the lead guitar tone occasionally gets a little raucous, the mood is generally beautifully restrained. Given the dominance of the guitar and the very sweet tones used, I’d be very surprised if John Mayer’s Continuum album was not in the minds of the producers of Soulful Pop. Indeed, for maybe a dozen or so of the kits, I found it very easy to imagine John Mayer’s voice layered over the top of this instrumental material. If ‘Gravity’ or ‘Waiting For The World To Change’ is your sort of thing, and you want an instant dose of something similar, Soulful Pop is where to look. Aside from one or two of the kits that were perhaps a little less inspiring, my only other observation would be on the variety within each kit. While the main parts and the variations are good, when trying to construct a full song arrangement, I was occasionally left wishing that the variations were just a little bit more ‘different’ from the main part, so a more obvious verse/chorus contrast could be established. These minor comments aside, Soulful Pop is class in a glass. Just add vocals!